Please select the bikes for comparison and click the Compare button. Enter your postcode so we can find your local Diamondback Select dealer. Once your dealer is found click the 'Details' button then enter your contact details so the dealer can get in touch with you. Inner Tubes: Presta Valve 27.5"
There are many options available and selecting the correct type of bike is important. First you must decide what your requirements are and the type of riding you will be doing. This will determine which type of bike is right for you. There are many types of bike available for every day use, recreational leisure or specific disciplines. Specific frame geometries and components will affect the riding position and adjustment however you should be able to sit on a bike with a comfortable reach and your feet being able to touch the ground on both sides. This range of products will give you all the exhilaration you need whether in race or leisure conditions. 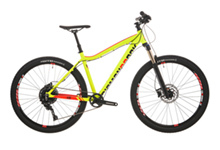 Each category has its own specific requirements and achieves the optimum balance between frame geometry, high tech material processing and component performance to energise your efforts. This covers many products but generally you choose between hard tails and full suspension. 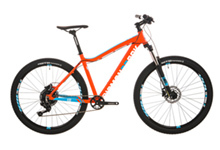 Hard tail bikes have rigid frames and a suspension front fork whereas a full suspension bike incorporates rear suspension. Mountain bikes are versatile and can handle off road conditions from rough rocky conditions to less challenging towpaths and bridleways. Hard tails are more responsive with the front suspension forks helping absorb the bumps with all the power pushed through the pedals transferring into momentum. Full suspension bikes are designed to handle more aggressive downhill conditions by adsorbing impacts whilst maintaining traction but on the flat some of your power will be lost due to the rear suspension. Not all mountain bikes are designed for serious off road riding. You need to look at the component specification in detail to ensure the function and quality are right for your requirements, especially the gear set and shifters, brakes, saddle, grips and tyre tread pattern. Riding position is important – the more upright the less impact will be placed on your lower back plus your vision will be improved. 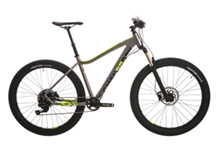 This category is a hybrid of road and all terrain bikes. Designed for tarmac riding with occasional off road riding on towpaths, bridleways or cycle trails. These are sleeker framed bikes with slimmer wheels and tyres for faster rolling. Some are equipped and others are more sporty, ideal for commuters and recreational riders. Electric bikes have come of age, delivering many miles of smooth, reliable, powered assistance. For those looking for some help going the distance, or an extra lap of the trail centre, whether you are just starting work or enjoying retirement, modern ebikes make cycling inclusive! Our electric bikes offer a high specification and performance for any budget. Throughout the range of bikes we have our female specific versions. These bikes have been specifically designed for the female body. Our bikes include subtle geometry changes that make the bike a more comfortable fit. There are other features which make the bikes more user friendly like step-through frames which reduce the height you have to lift your leg when mounting the bike. We've been creating great children's bikes for years. As a parent it's the name you know and can trust, with our design and technical expertise your child couldn't be in better hands. Every bike has built-in safety and lots of play value, it's our care and attention to these details that makes our bikes stand out from the crowd. Bikes come in many different shapes and sizes with many variations and specific uses – BMX, Dirt Jump, Downhill, Touring, Tandems and Folding. Click here to watch our Bike Assembly Instruction video.